"Study after study shows that the earlier a child begins learning, the better he or she does down the road...But here's the thing: We are not doing enough to give all of our kids that chance." The president's rhetoric echoed that of former President George W. Bush's failed No Child Left Behind policy, and the original Head Start program launched by President Johnson in 1965 during the rise of the Department of Education. Part of the failed understanding of this issue starts from the assumption that greater access to preschools/ pre-kindergarten education is actually beneficial to youngsters. Evidence has cast a shroud of doubt over this concept, showing that preschools really do not create any long term benefits to students in terms of whether it boosts their possibility of graduating with a degree in the long run. FreedomWorks policy analyst Logan Albright has put into question as to whether it is the right call in the first place to "remove children from their parents and impose a structured, one size fits all educational system on them". Numerous studies by education professionals have even shown that preschool damages a child's problem-solving ability by inhibiting creative thinking, backfiring from the original intent of the program in the process. "President Obama’s Race to the Top program awarded more than $4 billion in federal funding to states that implemented specified reforms. The result led to a lot of compliance costs for states without much to show for it. The Head Start early education program costs around $8 billion a year, despite the program’s own analysis finding that it doesn’t work. 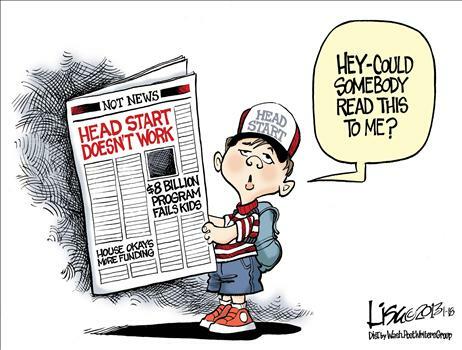 The programs keeping getting bigger and more expensive, but the results remain elusive..."
The depressing statistics regarding the students academic levels alone prove that Head Start has failed to raise the standards of the students that took part in the program. According to a column by Andrew J. Coulson (senior fellow of education policy at Cato's Center for Educational Freedom ), government researchers administered "44 academic tests" to students who were about to finish the first grade, in order to see the difference in results from students who had or had not participated in Head Start. After the results were looked over, they showed that "not a single one of the 114 tests administered to first graders — of academics, socio-emotional development, health care/health status and parenting practice — showed a reliable, statistically significant effect from participating in Head Start." American citizens must ask their policy makers an essential question, if pumping more money into these failed programs, which are detrimental to our students has proven not a single positive result, what will throwing even more tax payer money do other than prove to be even more wasteful? The constant waste, disappointment, and culture of corruption we are seeing in our academic institutions (in large part to intervention from the federal government) has proven that decentralization is the best way to help students achieve their highest potential when they are treated as individuals, instead of just cogs in the machine of blanket policies and resolutions. This is baloney! Head Start is a rousing success! It has to be, after all it was a major part of LBJ's "Great Society" program and is run by the Dept of Health and Human Services. Everyone knows what a fabulous program and an outstanding Government Department those two are. If it wasn't an excellent program our Government Bureaucracy wouldn't have pushed it on us.